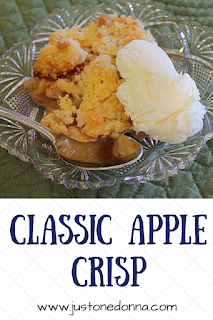 Apple crisp is a homey, comfort food that has always been a family favorite recipe. There is no better dessert to serve when the crisp, fragrant apples of fall are abundantly available. Our family's apple crisp is a bit different from the usual because the crumble topping is not made with oatmeal. Too many times I have been disappointed when ordering apple crisp in a restaurant because the crisp topping was made with oatmeal. When I say disappointed, I mean very disappointed. I will not eat apple crisp made with oatmeal! This post contains affiliate links for your convenience. When you purchase using these links you help support the costs to publish this blog. Pin this Apple Crisp recipe for later. 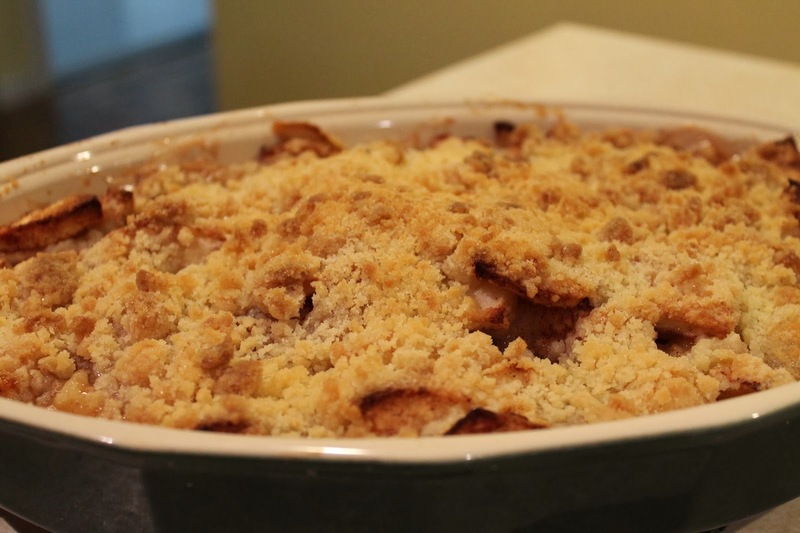 So, how do I make my apple crisp's crumble topping? It is a simple mixture of flour, sugar and butter mixed together with my fingers to make the crumbles. As the crisp bakes, the topping becomes golden brown, crunchy and in my opinion, perfect. 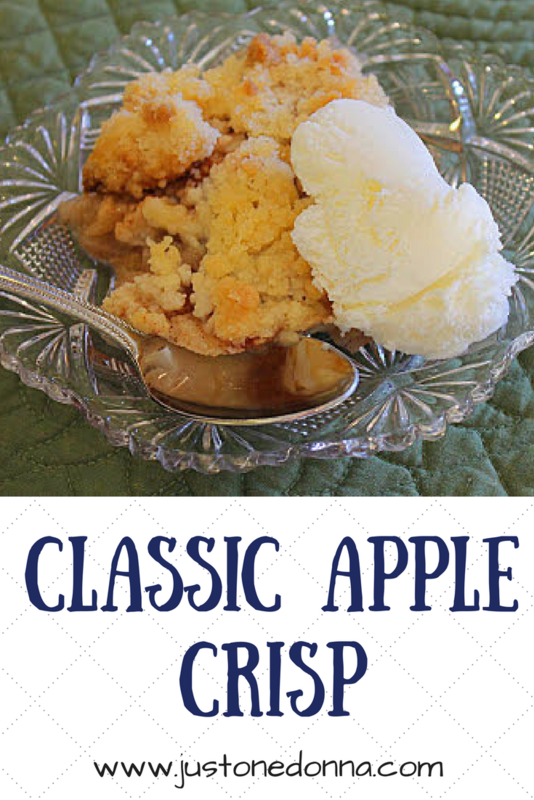 Serve this apple crisp warm with vanilla ice cream and you'll have a classic family dessert. Recently, I was talking about the simple deliciousness of this dessert with my brother and he pointed out to me that I had not included the recipe on this blog. I couldn't believe it. How was it possible I had overlooked one of my favorite desserts of all time? Today I rectify that oversight. Apple crisp is perfect this time of year. Whether you have been apple picking or are just selecting from the abundant supply of fresh apples you find in the grocery store, fresh apples make this dessert a family favorite. Apple crisp is a quick alternative to apple pie, too. No crust is required. Preheat your oven to 350 degrees F. Butter a deep dish pie pan . Pare and slice the apples into the pan. You'll want the apples to create a high mound in the pan. Squeeze the lemon juice over the apples. Combine the cinnamon, salt, and 1-1/2 tablespoons of sugar and sprinkle the mixture over the apples. Pour the water over the mixture. 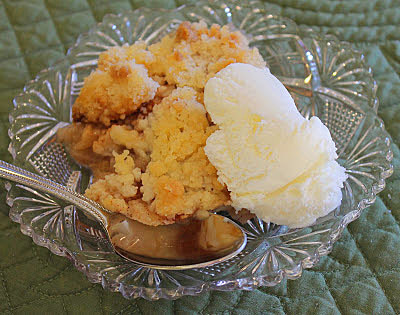 To make the crumble topping, combine one cup of granulated sugar, flour, and butter together in a medium bowl. Using your fingers, squeeze the ingredients together and toss them to create a well combined, crumbly mixture. Spread the topping over the apples. Bake on the center rack of your oven for 45-50 minutes until the topping is browned and crunchy. Serve warm with vanilla ice cream. Finally!! Someone who feels the way I do about oatmeal in crisp toppings. To me it feels and tastes like chewing chopped soggy cardboard. I am going to try your recipe tonight and I know it is going to be delicious! In the past when I made crisps I substituted corn flakes for the oatmeal. It gave it a slight crunch and had a much better texture and flavor. Thank you for your great recipe! High five, Pat!! I hope you love this topping. This apple crisp is truly one of my favorite desserts. Your corn flake substitution sounds interesting. I might try that, too. I thought it was just me. No oatmeal in my crisp either! So happy to welcome you into the "No Oatmeal in my Apple Crisp Club", Lori!